The Bride: For a formal wedding with a radiant orchid color palette, the bride can add a colorful touch with a beautiful orchid clutch. The Melie Bianco D2538-Jamie Clutch in berry is just the right shade and has a shiny gold frame. The rich jewel tone definitely lends itself to a swanky dress with lace and embellishments. I love how the Monique Lhuillier pictured above has a gold belt to help tie the dress in with the luxe color theme. A wedding dress so formal calls for a pair or satin jeweled Badgley Mischka dressy pumps. 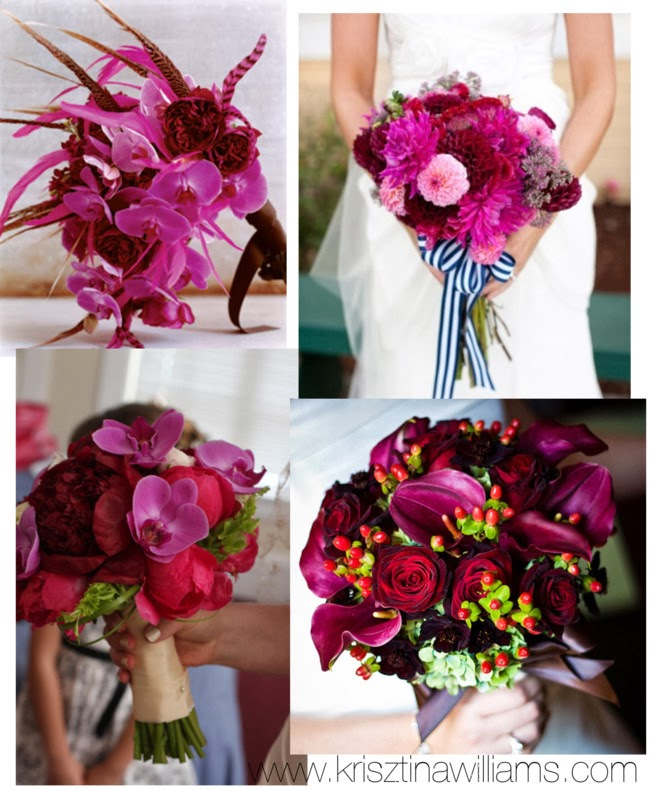 The Bouquet: Of course the best choice for an orchid colored wedding would be orchids, though you can incorporate many other flowers with the rich pinkish-purple shade. greenery mixed in beautifully breaks up the color. Tie it into the overall color scheme with a simple black ribbon. The Bridesmaids: For a formal wedding, bridesmaids should have long gowns. Strapless chiffon maxi dresses with a sweetheart neckline are very trendy and photograph very well. If your wedding is a bit more casual and you want shorter dresses, here is a great knee-length option. Get any of the David's Bridal dresses in "Sangria", as it very closely resembles radiant orchid, or look for fuchsia or berry in other designer collections. If you do go with a strapless bridesmaid dress, pair it with a gold-tone statement necklace. 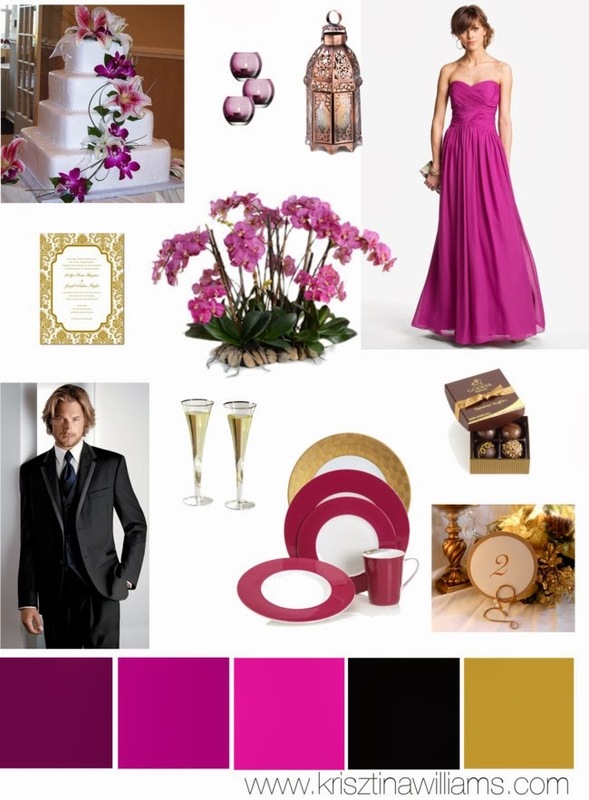 The Color Palette & Decor: A rich shade like orchid goes so well with gold, and you can mix in varying shades of the color. Anchor the palette with touches of black, in the men's tuxes and subtle details like in the favor packaging and table decor. The gold should most definitely be incorporated in the table decor, through gold chargers and glittering gold candelabras. The centerpieces should of course include beautiful orchid arrangements.